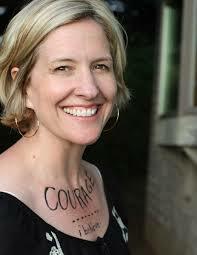 Brene Brown is the author of a trilogy of “Self Help” books that will rock your world. If you read the book in any kind of earnest you will reaffirm your commitment to living wholeheartedly and as a result you will better define your boundaries and stay in touch with your emotions. Ultimately this will clash with someone else’s expectations or values in variance with yours. Someone you care about. Let me explain with my own story. 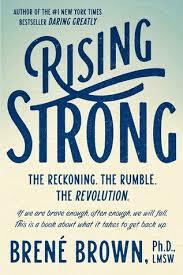 I received Rising Strong as a gift from my dear friend Mara V. Connolly who is an executive coach trained in the Daring Way. She knows I am a Brene Brown enthusiast and it was a delightful surprise to open an unexpected Amazon package and see her note. I was heading to Los Angeles so I tucked the book in my bag and began reading it almost immediately. I was only a few chapters in when I found myself triggered and face down in the dirt. While still in the whirlpool of embarrassment and hurt, I sent an angry, hurt-you-back text to the person in my “Rumble” in the cab rushing from to the airport. I risked airsickness while I wrote what I called my “first story” in my journal on my Southwest flight home. The next morning I realized that I needed help and I reached out to Mara to process. Over the next few days I figured out what triggered such a strong emotional reaction and the values that were stepped on. This helped me get clear about what new boundaries I needed to set with the friend in the Rumble. I wish I could report that my friend and I were able to be curious about each other’s triggers and clear. It did not go down that way and I have been processing the heartache that comes when a relationship is not what we hoped. As I read the rest of the book I kept referencing my Rumble. It was such a powerful learning opportunity. I especially struggle with the question, “Are people in general doing the best they can?” This cracks open my own harsh self-judgement for the times when I stumbled and did not live up to my own standards. Was I doing the best I could in that moment when I sent the angry text? I do not think so. The key to the question is “in general”. I am not asking: are people infallible? Instead I am choosing a more compassionate life philosophy. If I assume that people are in general doing the best they can in this moment, then I can extend grace and live life more wholeheartedly, that is a life defined by courage, engagement and clear sense of purpose. This assumption that people are doing their best first came up when I was coaching with Marj Plumb. The CTI Co-Active Coaching curriculum says every client is creative, resourceful and whole. I remember really challenging this with Marj. What about the people who are mentally ill? And Marj encouraged me to continue to start from the assumption that people are doing their best. Like forgiveness, starting from this place of grace and compassion is as much for my own benefit as the other person’s. If I assume that I am doing my best, I can be curious about my own triggers and extend grace to myself. This does not mean I never need to repair with someone for something I said thoughtlessly. It does mean I can lay down that incident as a lesson learned instead of continually using it as a lash to whip myself for my inadequacy. And get on with the business of leadership.